Girl Scout cookies, I remember selling them, eating them, freezing them so we would have them throughout the year....especially the Thin Mints (better frozen in my opinion!). This year when I went to order some Girl Scout cookies from a co-worker imagine my dismay to find out no vegan ones are on sale this year. That only leaves one option, make my own. 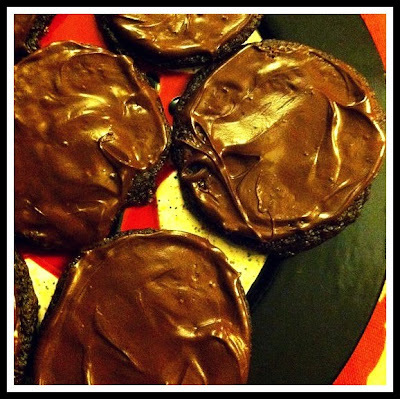 Here is a pretty amazing recipe for Vegan Thin Mints I found on the Internet. I'm pretty sure this it the first dessert recipe that's been featured on the blog, so that should tell you how good they are!! In a food processor, pulse flour, sugar, cocoa powder, salt, and baking soda until combined. Add margarine, milk, vanilla, and mint extract. Pulse a few times until mixture comes together. Transfer mixture to a large bowl and knead with your hands in the bowl for one minute. Chill the dough in the refrigerator for 1 hour. Preheat oven to 350 degrees F and line two large baking sheets with parchment paper or silpats. Remove dough from refrigerator. Roll a heaping teaspoon of cookie dough into a ball and place onto prepared baking sheets, leaving about 3 inches in between each ball. Evenly flatten the dough with your fingertips so that it is about ¼ inch thick and bake for 12-14 minutes. Let cool completely. Melt chocolate chips and margarine over a double boiler or in the microwave. Stir in the mint extract and mix until smooth. Dip completely cooled cookies into the chocolate and remove with a fork, gently scrapping off excess chocolate using the side of the bowl. Or, spread a thin layer of the chocolate on top of the cookies. Place cookies on a parchment-lined plate or tray and refrigerate until chocolate coating sets. Store in the refrigerator. 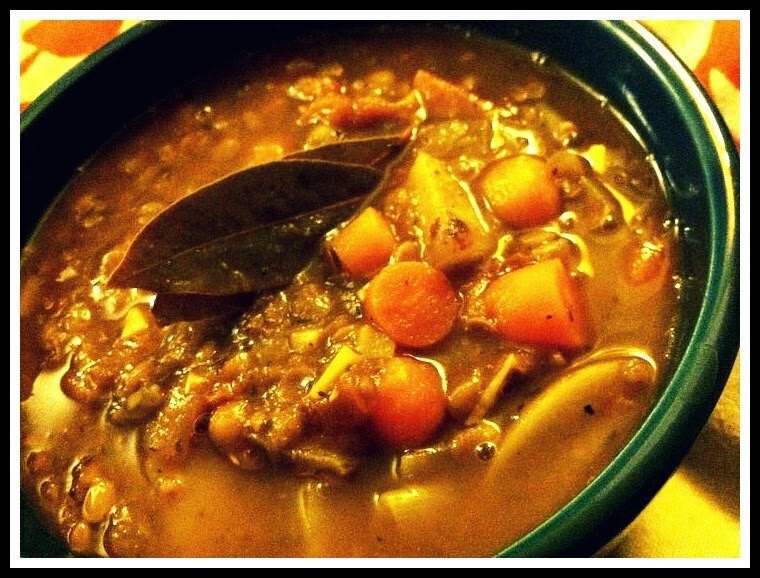 To make the stew: Preheat a 4 quart pot over medium heat. Saute the onion in olive oil, along with a dash of salt, for about 5 minutes. Add the garlic, thyme, celery seed, pepper and salt and saute a minute more. Add the lentils, baby carrots, tomatoes and vegetable broth. Cover pot and bring to a boil. Stir occasionally for about 20 minutes, until lentils are slightly softened (now is a good time to start the polenta.) Add potatoes and leeks. Lower heat to simmer. Cover and cook for about 20 to 30 more minutes, until potatoes are fork tender and lentils are soft. Let sit for 10 minutes or so to allow the flavors to meld. Serve over polenta, garnished with fresh herbs, if you like. To make the polenta: Bring vegetable broth and salt to a boil in a 2 quart pot. Add oil. Lower heat to simmer. Add the polenta in a slow steady stream, stirring constantly with a whisk. Whisk for about 5 minutes, until polenta is thickened. Keeping heat low, cover and let cook for 20 more minutes or so, stirring occasionally. The stew is super hearty and very filling!! So enjoy it, until next week! !